GAME 1 VIEWING PARTY at Railers Tavern! 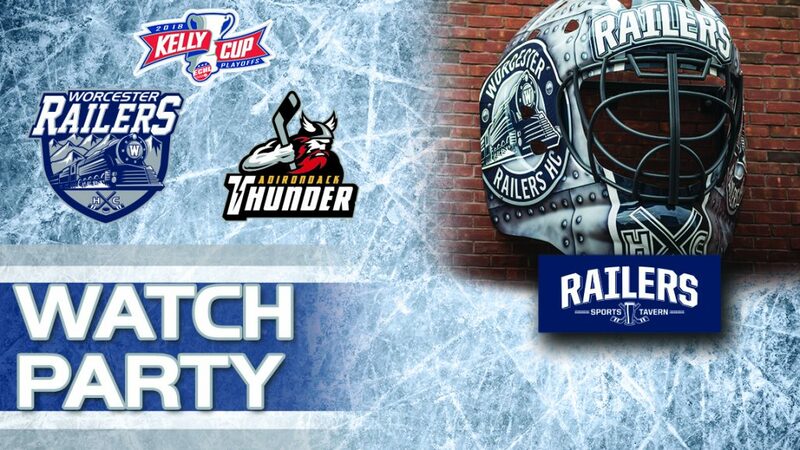 Watch Game 1 of the best of seven Kelly Cup playoff series between the Worcester Railers and the Adirondack Thunder at Railers Tavern on Friday at 7pm! Members of the Worcester Railers staff will be attending and will have giveaways and prizes! Wear your Railers gear to the Tavern on Friday night to get you ready for playoff hockey before the series shifts to the DCU Center for Games 2 and 3 on Saturday and Sunday! As always, Eric Lindquist and Tom Matthews will have the call live on 98.9 Nash Icon beginning with a 30 minute pregame show. Adirondack returns to the postseason for the third consecutive season after capturing the North Division regular-season title for the second season in a row while Worcester enters the Kelly Cup Playoffs in its first season of existence. The Thunder went 7-3-0 over their last 10 games to overtake Manchester for the division crown. Shane Conacherled Adirondack, and was tied for 15th in the ECHL, with 63 points (20g-43a) during the regular season. Desmond Berginprovided an offensive punch from the blue line, as he was tied for fourth among defensemen with 15 goals and tied for eighth with 43 points. Worcester comes into the Kelly Cup Playoffs on the heels of a 22-8-3 run over their final 34 games to qualify for the postseason. Barry Almeida, who won a Kelly Cup title with Reading in 2013, led the Railers in the regular season with 22 goals and 61 points. Mitch Gillam, who was named to the ECHL All-Rookie Team, was fourth among ECHL goaltenders with a 2.15 goals-against average and a .925 save percentage during the regular season. Adirondack went 4-5-3 against the Railers in the regular season while Worcester was 8-2-2 against the Thunder. Conor Rileyled Adirondack in the season series with four goals, and was tied with Bergin for the team lead with seven points while Woody Hudsonled Worcester against the Thunder with nine points (4g-5a). /_media/logo082018.png 0 0 admin /_media/logo082018.png admin2018-04-11 15:52:222018-04-11 15:52:22GAME 1 VIEWING PARTY at Railers Tavern!